Good Tuesday morning. Today I’m sharing two fun cards made with the new Rubbernecker Stamps Ice Cream Truck set. I paired the truck with the new Picnic Table set, Winter Tree, Small Ivy, Tiny Flower Buds, Small Birds and Deckle Hills. I used the largest frame from the Rectangle Combo #4 for the top card and the largest frame from the Rectangle Combo #3 for the bottom card. Cut the truck out using two different colors for the body and black for the wheels. Follow the directions below and attach them together using glossy accents. These directions will live on the Rubbernecker site with the link to the ice cream truck. Cut the ice cream cone parts out using Kraft cardstock and attach them together using glossy accents. Cut out the ice cream and attach to the cone using glossy accents. Attach the ice cream cone to the top of the truck using glossy accents. Cut the ground sections using the Deckle Hills die using green cardstock. Attach the ground piece to the front of the frame using double stick tape. Apply a light blue sky area to the card base using Tumbled Glass ink and an ink blending tool. Cut the trees using Kraft cardstock and apply Antique Linen ink using the direct to paper technique. Cut several sections of the individual leaves from the Small Ivy set using green cardstock. Cut the tiny flower buds using colors that match the trucks and form them using a small tipped stylus and molding pad. Attach the leaves and flower to the trees using glossy accents. Attach the trees to the back of the frame using double stick tape for the top card and to the front of the frame for the bottom card. Cut the picnic tables and benches out using cardstock that matches the trucks. Cut the tablecloth using designer paper that match the tables. Attach the table cloths to the tables using thin strips of mounting tape. Cut the birds and apply black to the beaks using a black marker. Apply pieces of mounting tape to the back of the trucks and attach to the card base. Tuck the table and benches in behind the ground layer and attach using small strips of mounting tape. Attach small pieces of mounting tape to the back of the birds and attach in the sky area. Hand write a menu on the little sign and attach it to the scene with a small piece of mounting tape. 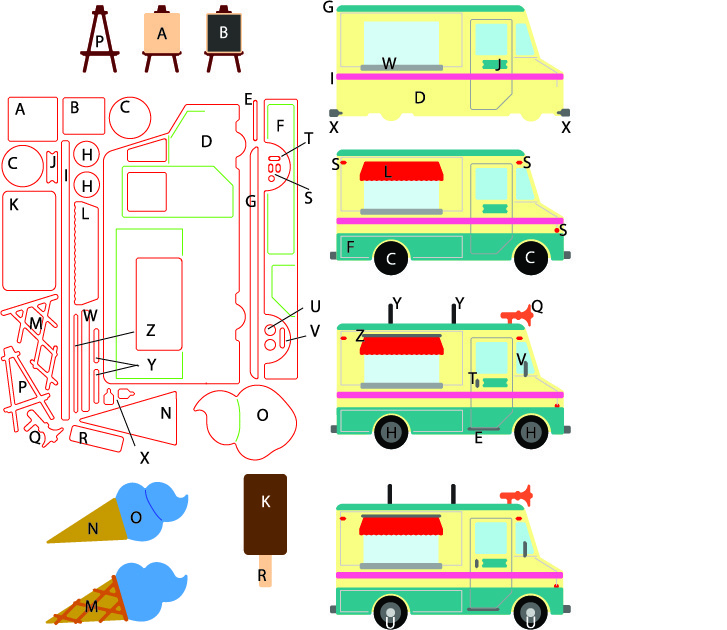 The die cut ice cream truck is perfect for lots of different occasions. And it could be fun made as a food truck with lots of different menu themes. Don’t be fooled by how technical the instructions look because the pieces are easily identifiable and easy to put together. Thanks for coming by and I hope you have a good day. Your ice cream trucks are sooooo cute!!!! I love the ice cream cone on top! This is amazing! It does look very complicated until you realize its the truck plus the table and the sign as well as some very yummy looking frozen treats. The lettered guide would make it a lot less frustrating to deal with. The sweet pastel colours and the pretty blossomed trees behind them look so fresh and fun for spring. A lovely sign of warmer weather and very welcome after sitting here today looking out at freezing rain and snow.